Inspiring Bella Crafts: 24 Days of Christmas at Whimsy. 24 Days of Christmas at Whimsy. 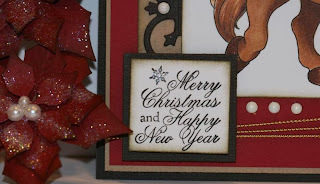 The design team for Whimsy Stamps are having a "24 days of Christmas Party. Every day a new inspiration card will be posted on the Whimsy blog and today is day 15 my turn. 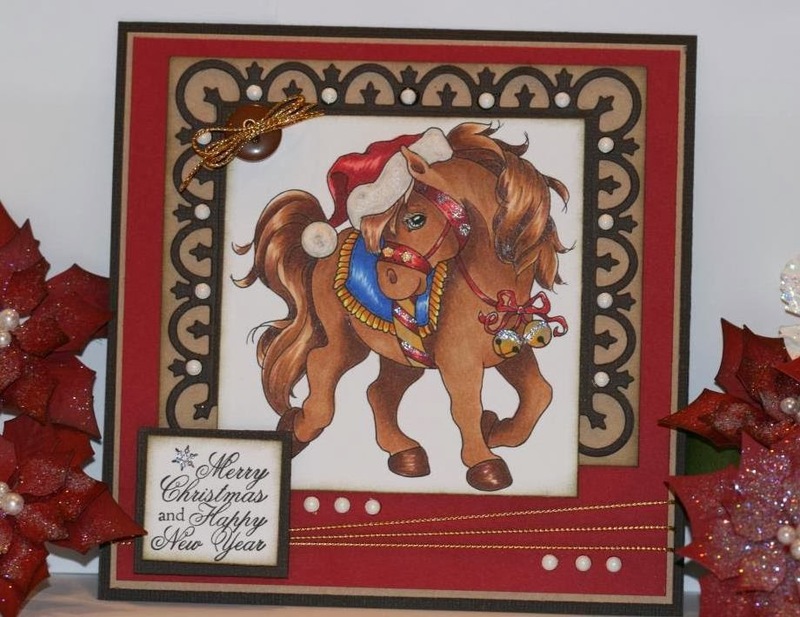 I used a super wonderful image called Christmas Gift Horse by designer Crissy Armstrong from Whimsy Stamps. I colored my image using copic markers, the sentiment is from vintage Christmas rubber stamp set from Whimsy Stamps, I used a Fleur De Lis Rectangle spellbinder. and Imaginisce heat set pearls. Every day from 1st to 24th December, a member of the design team will be sharing a brand new Whimsy holiday creation on the Whimsy blog. Included in these daily posts will be a LETTER. Visit the Whimsy Stamps blog every day, make a note of each letter and keep them safe. Once you have collected all 24 letters, you should be able to unscramble them and make a 4 word phrase. Email your phrase to whimsystampscontests@gmail.com by 31st December 2013, and if you've guessed correctly, you will be entered into the draw to win a fantastic GRAND PRIZE! But that's not all! We will also be running some fun SPOT PRIZES throughout the entire event. The prizes could be hidden either on the Whimsy blog or on our design team member's blogs, so be sure to leave a comment both on the Whimsy blog and on our DT's blog posts each day to be in with a chance to win! Your card here are absolutely stunning and really beautiful colored. An amazing creation, that´s for sure. Pretty card with wonderful coloring on the horse! Gorgeous card, Charlene! Fantastic coloring! Love how you framed the image! This card is so grand. What a beautiful job!!! You coloured your horse beautifully Charlene. Great card. I love this Whimsy stamp image! Great job with the copics. Charlene, I really love the way you coloured the "Christmas Gift Horse" stamp, beautiful job! Gorgeous card. Chrissy's image is so sweet. Your copic work is absolutely fantastic. Love the little touches of glitter too. What I wouldn't give to be able to color like this... gorgeous. I must say, your colouring is AWESOME! Just perfect! Such an adorable image and I really like what you did to the bells too - they really pop! Wishing you a joyful day! Such wonderful details in your coloring. Lovely card. I really like the frame togheter with the image - fits so perfect. Beautiful horse image and your coloring is amazing!! Really love the simple design! What a gorgeous horse image. Love the details on your card! Your creations are absolutely lovely, Charlene. I had so much fun browsing through your blog to see all the sweet cards and projects. You do amazing work, and are super creative. I'd LOVE to have you stop by and share with us at Word Art Wednesday. Our challenges are weekly, and always Anything Goes. We offer great prizes, and I'd really enjoy having you share your sweet art with us. I hope to see you soon! I love your coloring on this cute Christmas Horse! I also everything else about your card too! Holy Moly Charlene!!! Your ocloring of Christmas Gift Horse is OUTSTANDING!!!!! Happy Holidays!!!! This is gorgeous and your coloring is fabulous. Love the frame you used around the horse. Awesome card. Beautiful Card.. Love your coloring of the horse.. Fantastic Framing and the sentiment is Beautiful!! beautiful image and wonderful colouring too a really special card, thanks for sharing.